Looking to impress the chocolate lover in your life? Pick them up something extra special or make you own gift using the finest ingredients at home. Flowers, jewellery, cologne – these classic Valentine’s Day gifts are guaranteed winners on 14 February. But for food lovers (especially those with a sweet tooth), you can’t beat a bit of chocolate. This gives you two options; buy something special from a top chocolatier (companies such as Godiva always have a special Valentine’s Day range) or shoo your partner out of the house for a day while you melt, temper and chill something special yourself. It’s probably best to leave boxes of chocolates to the experts, unless you have a variety of moulds to hand, but you could make some hand-rolled truffles flavoured with your beloved’s favourite ingredients. Bruno Loubet makes his truffles extra indulgent with Drambuie, while Paul A Young stays true to quirky form with his Port and Stilton offering. 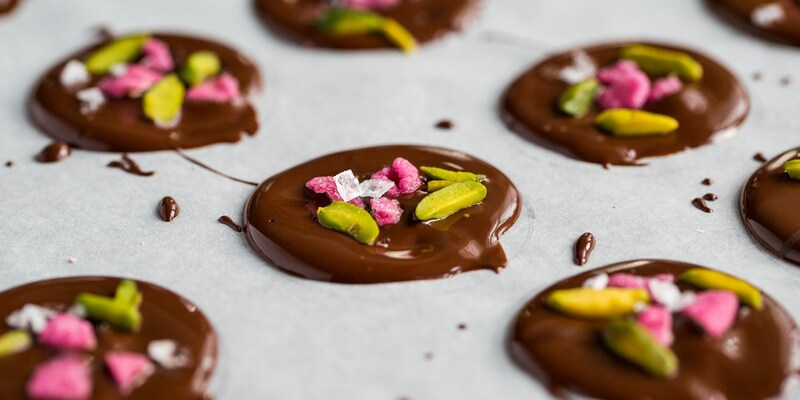 For a pretty finish, try covering your chocolates in crystallised rose petals, seen here in Karen Burns-Booths recipe, or personalise mendiants like Louise Robinson with brightly coloured nuts and flowers. Just make sure you buy the best quality chocolate you can find – it’s the most important ingredient. If you’re planning to cook a romantic meal on Valentine’s Day, then the world’s your oyster in terms of chocolate. A rich, indulgent dessert is the perfect way to finish off the night, but make sure it looks as good as it tastes. Bryn Williams’ take on the Jaffa cake is a heavenly combination of chocolate and orange, while William Drabble’s Chocolate mousse cake is finished off with beautiful sugar work. If you’re a little unsure of your skills in the kitchen, don’t worry ­– there are plenty of recipes that are simple to make yet look just as amazing. Karen Burns-Booth makes a decadent cheesecake out of just seven ingredients which doesn’t even need baking, while Victoria Glass whips up a batch of Chocolate and salted caramel cupcakes. If your partner suffers from a food allergy or intolerance, there are still plenty of dairy-free, gluten-free and sugar-free recipes that celebrate chocolate. Despite omitting both gluten and sugar, Tess Ward’s chocolate supreme cake is a strange sounding but delicious tasting mix of black beans and agave syrup, while these Gluten-free Florentines are glossy, well-tempered and stuck together with honey.